BERLIN, Sept. 2, 2018 /PRNewswire/ — On August 31, 2018, the 2018 Internationale Funkausstellung (IFA) Berlin opens on schedule. In the first day, a series of breaking news has made China brand SKYWORTH become the focus immediately. 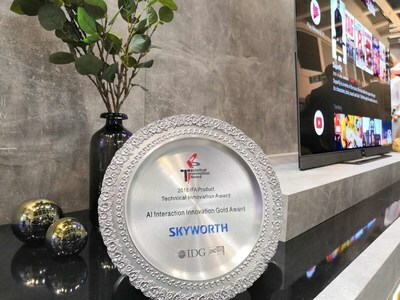 This year is the 30th anniversary of SKYWORTH, S9A, as the annual OLED product, won the “AI Interaction Innovation Gold Award” of IFA Product Technical Innovation Award. SKYWORTH unveiled “AI” brand strategy and set up a new brand METZ blue, which will be launched Europe, India and Hongkong, China in September. 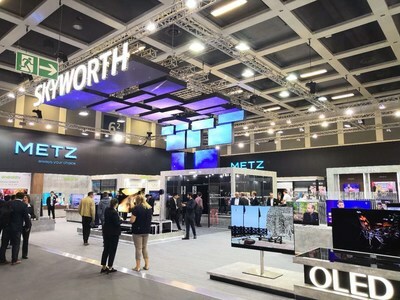 SKYWORTH exhibited 100-inch giant screen TV G9, excellent OLED series TV (W80, S9A, S8A), Android TV with “AI” conception and Coocaa Lite TV with cloud-based voice service Amazon Alexa and Prime video, etc. This exhibition also has a super TV experience room. The 86-inch large screen TV F7 to feature Dolby Vision HDR imaging technology, paired with a 7.1.4 Dolby Atmos home theater system, delivers a spectacular and immersive experience. A smart experience room is also set up to highlight the forefront of AI development. In the series of products, S9A, the flagship OLED TV, has won the “AI Interactive Innovation Gold Award.” As the forerunner of AI technology, SKYWORTH also announced that “AI TV” will be the brand strategy from now on. Focus on artificial intelligence, create smart family, realize multiport interconnection. SKYWORTH AI TV is a comprehensive AI product, it represents not only the Artificial Intelligence in ecosystem, but also the Artistic Inspiration of design, the Aesthetic Image of picture quality, the Acoustic Instrument of the sound quality, and the All-In-1 system. The strategic reflects SKYWORTH’s ambition to expand its skills in the AI field. The “AI Interactive Innovation Gold Award” is well deserved for SKYWORTH comprehensive product layout from high-end OLED TV to smart TV. SKYWORTH also launched a modern luxury brand METZ blue. This is another step after SKYWORTH’s successful acquisition of the German luxury brand Metz company in 2015. While the original brand Metz classic continues to occupy the high-end market in Germany, METZ blue will be more inclusive and more suitable for young generation. From September of this year, METZ blue will be launched in Europe, India and Hongkong, China.